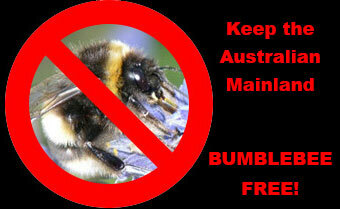 Horticulturalists have been lobbying for many years to introduce European Bumblebees to Australia for crop pollination. Two Bumblebee import applications by horticulturalists in 1997 and 2004 have already been rejected by the Government because of the risk that exotic Bumblebees pose to Australian farms and bushland. Bumblebees are used in many overseas countries to pollinate greenhouse crops such as tomatoes, cucumbers and eggplants. However, an Australian native bee alternative pollinator is available: the Blue Banded Bee! -- Produces tomatoes 15-20% heavier than those that are currently produced by growers using their conventional vibration wand pollination system. The importation of foreign Bumblebees should not even be considered when a promising native bee alternative is available! Some husbandry issues with the Bluebanded Bee still need to be solved. However, the research has only received limited funding so far. Instead of continually lobbying for the introduction of exotic Bumblebees, the horticultural industry should support the development of this Australian native bee alternative pollinator. -- Adelaide University research update in 2012. -- Adelaide University research update in 2008. -- Adelaide University research update in 2006. 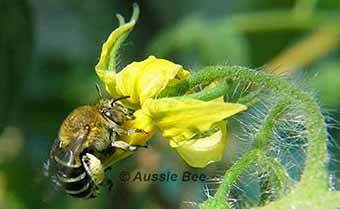 -- Aussie Bee Online, article 9 (2006): Tomato Pollination with Blue Banded Bees: The Results Are In!